Sundays at my house is a big thing. There is always food, fun and football! After all the Big Game will be here on February 7th and we know who we're rooting for. While I'm a transplant from New York in Colorado, my daughter was born here so whenever her team, the Denver Broncos have a game we have to show our support. That doesn't mean that there isn't a big rivalry before the Big Game starts. That's always a given. 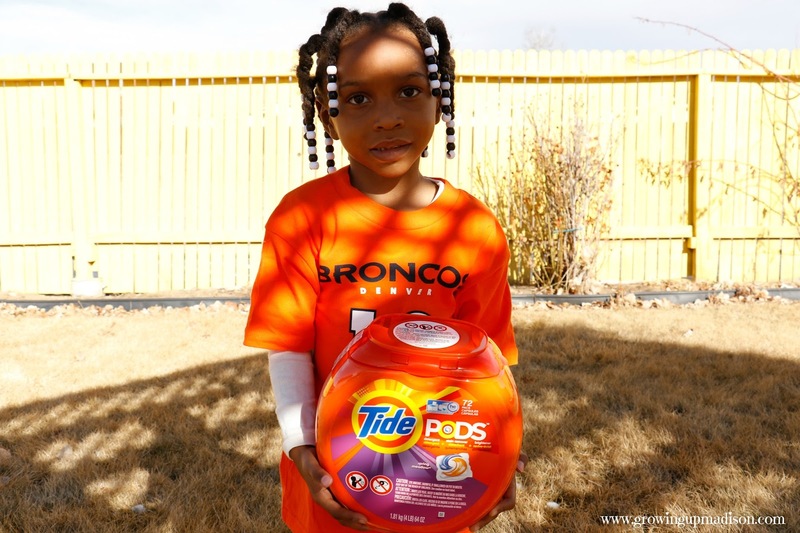 However the Big Game also comes with Big Game Traditions and Procter and Gamble is always there to help us score! From the prep time to after clean up they're there and the best news is that you can pick them up at your local Walmart at their every day low prices. Before our game starts, especially if we have friends coming over we always make sure that our house smells fresh and clean and Febreze Air Effects Linen & Sky does the job for us. With pets and kids there are always some odor lingering about and Febreze eliminates those odors instead of covering them up. The smell is subtle and not too overpowering. I have a very sensitive nose so don't like very strong scents and this is awesome. When you have guests over you need to make sure that your bathroom is clean and smelling fresh so the Febreze works great here too. With all that food and drink there is always the chance that someone has to use the bathroom and the one thing that is kept in there is Charmin Ultra Strong. Our septic system isn't that great here where we live and I feel good knowing that my toilets won't get clogged because they are both clog and septic safe. Since it's also 2-ply with a washcloth like texture I also know that my kids or whoever uses it, their bums going to be clean. We love cooking and we always make sure that there is enough food for everyone. With food comes messes and the Bounty Select-A-Size is perfect for those messes. The one thing I love about Select-A-Size is that there is no waste. You choose the size you need and they absorb the messes you make. And speaking of messes, Game Day means that we have to wear our teams t-shirt. Tide PODS Spring Meadow however is what we use to clean the messes out of our shirts after eating all the delicious food we serve. My mother was the one who turned me on to Tide. She would NEVER use anything else. She once told me, "spend your money on something good so you won't have to spend money again, because that is just wasting it", and boy was she right. Ever since Tide came out with their PODS it's all that I use. It's 3-in-1 (detergent, stain remover, brightener) so it does the job without me needing to use anything else. It dissolves easily and quickly in hot and cold water and works in standard and HE washers. Now I mentioned that our Sundays are filled with food, fun and football but mostly FOOD! It's the one thing that totally make us so today I want to share with you one of our easy recipes, our BBQ Pork Sliders. I whipped up these fun little sliders yesterday using the leftovers from my 3-ingredient barbecue pork, and they were a huge hit with my guys! The exact amount you'll need for your recipe will vary depending on how much leftover meat you have, so this is more of an idea than an exact recipe. The slider buns I bought were very small (just how I like them), so I only needed 1/4 cup of meat for each one. You may need more, or you could just make regular-size BBQ sandwiches. We absolutely love coleslaw on our sandwiches, so you can either use a store-bought coleslaw or whip up your favorite recipe. I love making my own sweet coleslaw. You could also omit the coleslaw and use cheese, sliced onions, tomatoes or whatever else you like on your barbecue sandwiches. Enjoy! Warm the pork and BBQ sauce in the microwave and set aside. Lightly toast the slider buns in the oven, if desired. I like to brush mine with a little butter and broil them until lightly toasted for added flavor and texture. Top each slider bun with approximately 1/4 cup of the shredded pork, drizzle with barbecue sauce and topped with a tablespoon or two of coleslaw. Serve immediately with extra sauce for dipping if desired! 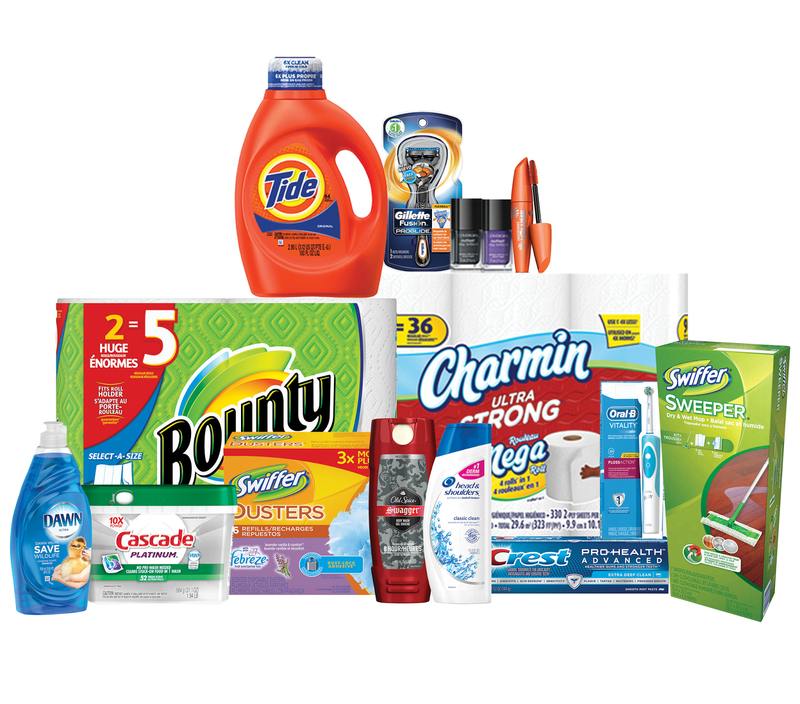 When Game Day rolls around we will be so ready with our Procter and Gamble products that we will be picking up at Walmart. We'll be ready before the game starts and after. I know there are going to be messes but it's going to be fun messes and I'm not going to worry about it. So head in to Walmart and get your pre-game and post game clean up products and get ready for Game Day! Let's discuss: What are some of your Game Day Traditions? I love anything that has shredded pork in it! Perfect for game day or just a busy day this looks delicious. Oh Jeanette it is delicious and super easy to make too. Make for a great Game Day food. Those sound so good! I am going to have to make these sliders sometime soon! If you do let me know how you like them. I'm sure Chris and the boys would enjoy them. I've been using the yellow Tide.. Not sure what it is called, but it is doing a great job of getting our clothes clean. I LOVE Tide and it's really the only detergent we'll use. It not only leaves your clothes clean but smelling great too! GO BRONCOS!! 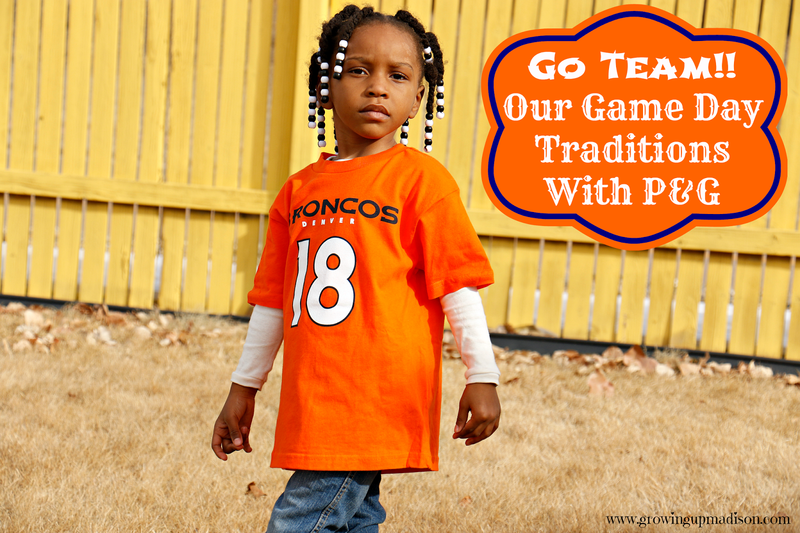 We were rooting for the Steelers yesterday but I'm still happy that the Broncos won. We dress up on the big game day too and we root for our teams with a lot of finger foods. Food and more food. I am going to try this because I'm going to try your 3 ingredient pork loin and I'll probably have leftovers to make this. My family would LOVE this one too. Those sliders look absolutely amazing. I use P&G products and so do my adult kids. I think most people use a lot more P&G products than they realize. I love them. I love Tide Pods - they're perfect for when the kids are doing their own laundry. No spilling or using too much (or too little). It's one of the reasons I was glad they were invented. You only need just 1. The kids would totally waste the liquid and the powder so this great! I love Tide Pods (did my own post about them once, too)! The only thing that would get my hubs' Navy uniform smelling gooood. ;) I also love Bounty and I totally want to come to your place for those sliders. YUM! You're more than welcome to hang out with us on Game Day. As for the PODS, I've found that they made my military uniform smell so fresh and clean when I was in as well. After a day in the field we would come home stinking and they worked like a charm. Febreze is always a good idea before game day for us. Our cat likes to sleep on the couches so it's good to vacuum and Febreze the living room. I love the sliders! We use Febreze before the game, after the game and basically all the time. Our dogs are usually in the living room joining in the fun and looking for any food that falls on the ground so I try and make sure our house smells great. Great game day traditions! I can't wait to start our own with our son as he gets older. I'm sure he'll enjoy them right along with you. It’s not a surprise that you’re also preparing for the big game. I’ve many friends who are doing the same. I think a lot of people might be preparing for the big game since it's so close by. My hubby loves pulled pork sandwiches and this recipe would be a nice one to make too. Game day Sundays are also big in our house, and it can be as noisy and as messy as you can imagine! Oh trust me I can imagine because it's the same thing at my house. Lots of noise but oh so much fun. We don't have any game day tradtitions but everything we do always involves food so those sliders would make it on the list. I hope they make it on the list, your family would enjoy them and it's never too late to start a tradition. I love watching the big game. Of course, there is the football, but for years I have always been obsessed with the commercials, much like others. But, the number nerd in me like to know the commercial statistics that come out following the big game. Its crazy to me the money those companies spend on game day commercials vs normal programming and neat to see the (ROI) return on investment. Oh we just love the commercials too and the Doritos ones are always a hit in my house, especially since we love them so much. It's sad that the Tide pods are not available here in our local supermarkets. I bet it washes off dirt effectively! Are there other scents? Oh I'm so sorry that you don't have them. Yes there are available in a variety of scents. You can check out P&G website for more info. I love sliders with coleslaw and your look amazing!! I may need to make these soon!!! You would so love them if you give them a try. Let me know if you do. They are great finger foods as I like to call them and everyone loves them. You should give them a try and if you ever make them let me know how you like them. Tide Pods my laundry bff, I make sure I stock up on those babies. Those sandwiches absolutely looks delicious! We're getting ready for game day too! You and me both! Whenever I get coupons I stock up because with 4 kids I always have a ton of laundry so I need to keep them in stock at all times. I can't wait to see what your hubby comes up with for your own game day. Your pork sliders looks super delicious! Ihaven't tried tide pods yet which I should, your post is motivating me to do that. I really think that you should. They are amazing and I don't how I survived without them before. Yummy! I love pulled pork and it's been a while since I made some. I will have to make this again soon. Those sliders look amazing and the way we eat, paper towels from Bounty would be a must! I hope your Broncos do great this weekend - Manning seems like a nice person! 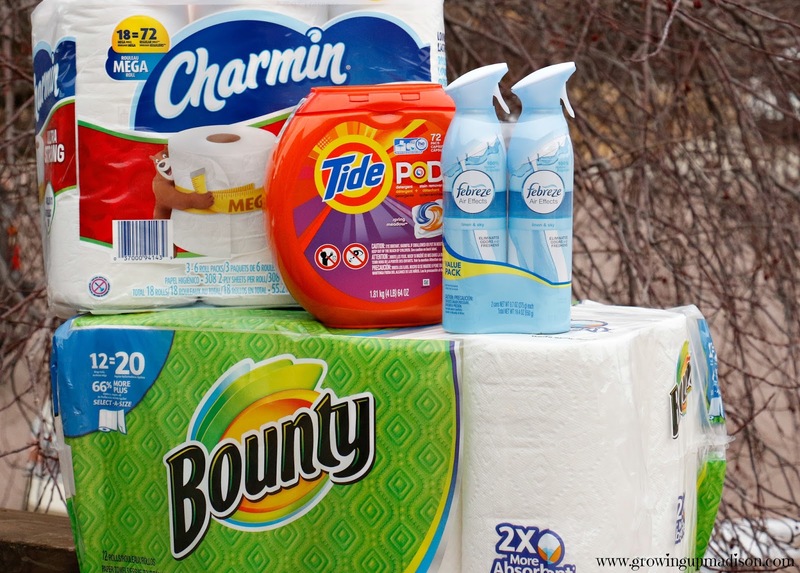 Paper towels are a must in our household too and Bounty is our go to product of choice. I hope they do great this weekend as well and Manning is awesome. I went to the training camp and met him in person and he was very humble. Lots of cool products and your recipe looks delicious! Hope you enjoy all the games this season with your family. Thank you. I hope you enjoy the games with you family as well. 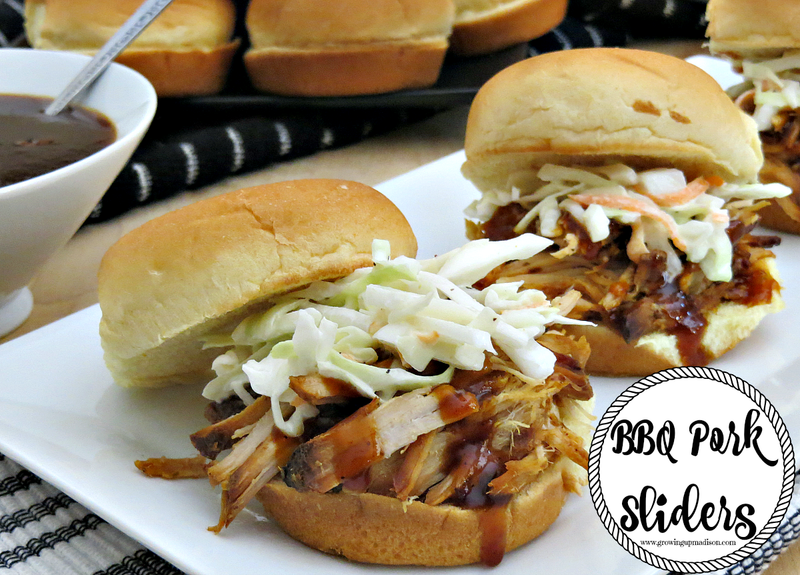 These BBQ pork sliders look so delicious. My family will love them. I will have to get the ingredients so i can make them this weekend. Those sliders absolutely look delicious. A nust-try, no doubt and totally perfect for that game day. Oh they are perfect for game day. We will be making them again on the big day since everyone loved them. Those sliders look amazing! We don't really watch a lot of football around here but we're always up for some delicious food! Sliders are a party fave...I don't eat meat but those look delicious! Well you can always substitute it with something veggie I'm sure. My daughter is a vegetarian and she just gets veggie patties. These sliders look amazing! I'll have to try these out sometime soon. In fact I may have them at the superbowl. I usually have something simple during the superbowl. Yes we always have lots of finger foods at the Super Bowl as well and these will definitely be on the menu. Can't wait for Game Day. These BBQ sliders look and sound delicious for sure. My sister has game day parties all the time during football season so I will have to share this recipe with her. I will bring the Bounty which will be needed with these yummy sliders. Oh yes you're definitely going to need the Bounty for that but don't forget to get the other products for after and before the game as well. Yes we sure are and we can't wait! I don't eat meat, but I know that my family would love this! My family and I really don't have a Game Day tradition, but we do love to wear apparel that supports our favorite teams. Love the sliders, they look sooo good! Yummy! We also love P&G at our home!! Thank you and P&G is definitely one brand that always has a home in my home. Thank you Yona. You should definitely give pulled pork sliders a try. I'm sure you'll love it and maybe you can start some game day traditions of your own. GO BRONCOS!! 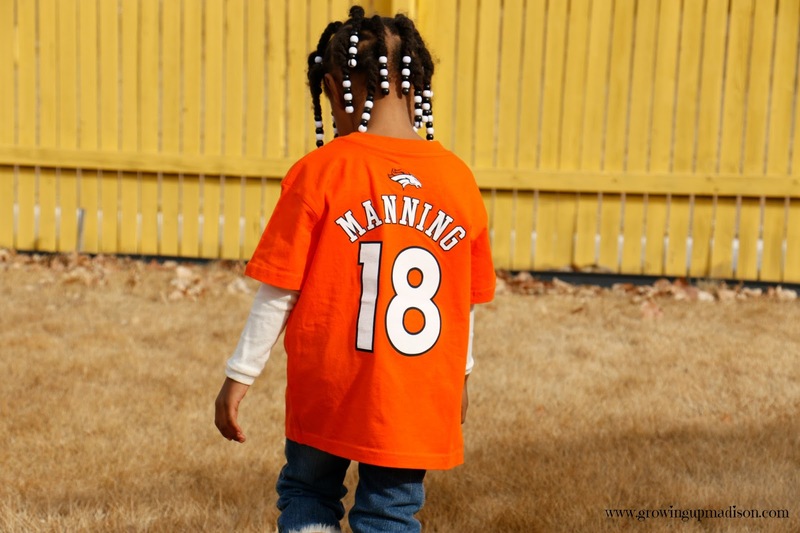 I am loving Madison in her Manning shirt. We don't have any game day traditions but we do have lots of food on Super Bowl day. I love shredded pork, it's a quick & easy dinner and perfect for a big crowd for football, or any other big game! My fiance is a huge NCAA fan, so when March madness comes he loves watching it, and when UConn plays he goes crazy. I love Tide Pods, they are amazing, I love that I don't need to add in a stain remover or anything else. You're right, shredded pork is easy and quick and almost everyone loves it. Who invented the Pods need to be applauded because it makes doing your laundry so easy. 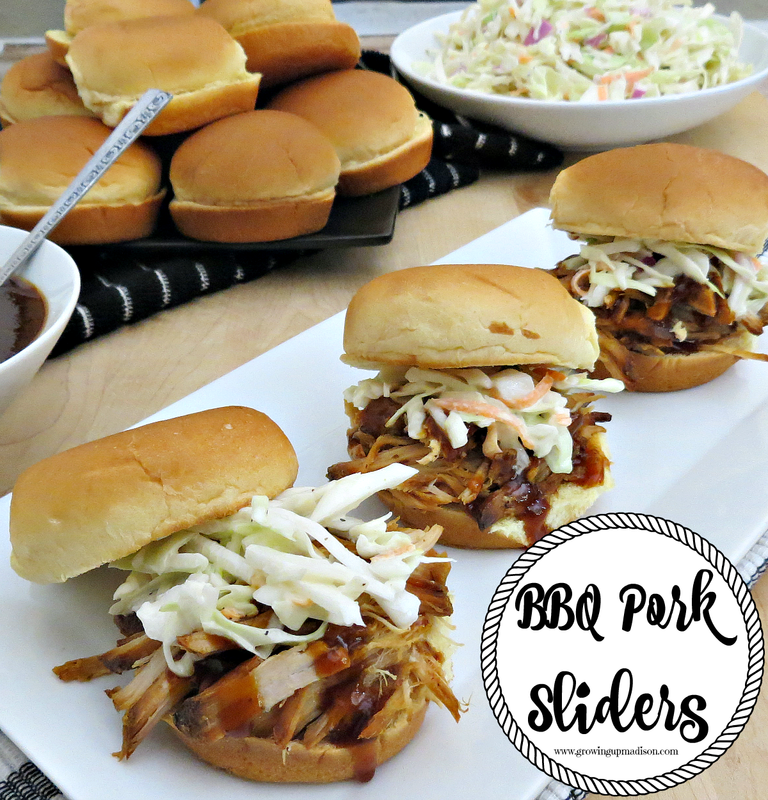 I'm lovin the looks of those BBQ pork sliders! I have to make some. If you do please let me know how you liked them.